Upon Googling my assigned mural, I was thrilled to discover that it lives a speedy little four-minute Uber ride away from my favorite obnoxious wine bar. Knowing I was going to have to venture deep into the Bywater to visit Henry Lipkis’s The Third Line, naturally my first instinct was to use this assignment as the perfect excuse to drag my boyfriend to Bacchanal for some sunset charcuterie and rosé. Obviously. Lipkis’s piece doesn’t have a set address to call an Uber to, so when the beat-up Toyota Camry arrived outside of my boyfriend’s frat, I met the driver’s confused expression with the explanation, “We’re going to see a mural!” Looking us up-and-down, the driver skeptically repeated my directions. After triple-checking with us that 2600 St Claude Ave. was really where we were trying to go (I imagine he was replaying the previous scene of us clomping down the SAE porch — me in my booties and my boyfriend in his pressed khakis), we set out for our destination. 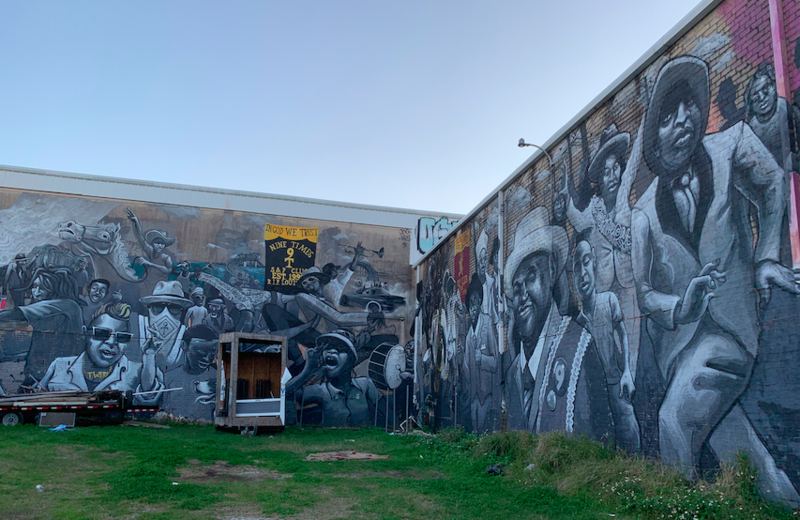 Upon arriving at the mural, it became obvious why our driver had trouble believing I, in my 3-inch heels, wanted to visit the dilapidated storefront of the permanently-closed Frankie and Johnny’s Furniture Store. Carefully getting out of the car, I wobbled over the broken sidewalk and littered lot to approach the mural. As I was closely monitored by several nearby groups of amused locals grilling out of the back of their trucks, it was fairly obvious that the driver was not alone in his confusion. My first draft of this mural review would probably make both my driver and the bystanders cringe, cry, or cackle. Actually, realistically, my original piece probably would have elicited a powerful combination of all three. But not in a good way. Throwing around words and phrases like soul, booty-shakin, soul, rhythm, soul, boogie, soul, jam, and soul I thought I was doing the mural justice— you know how it goes, really just lettin’ my readers know how down and chill I am with the culture. Trust me guys, I get this mural, this mural speaks to ME. I even made claims that I could practically hear “feet thumpin’ and trumpets blastin’” just by standing in front of it. Seriously, Mia? Oy. Being a relatively naive white, upper-middle-class, Jewish girl from the suburbs of Boston, it’s not only the scene on the mural that is unfamiliar to me. Although I have just finished my third semester living in New Orleans, the community, the dancing in the streets, the rhythm, the songs, the togetherness, the instruments, the outfits, the neighborhood, the history, the oppression, the journey, the overcoming, the culture, and the group identity and purpose depicted in the mural are all not mine. To pretend otherwise and write from a perspective of fake belongingness was simply awkward. Why do I get to pull up with my freshly-straightened hair and lip-gloss and then pretend to explain a complex story that in no way belongs to me? Not a chance. 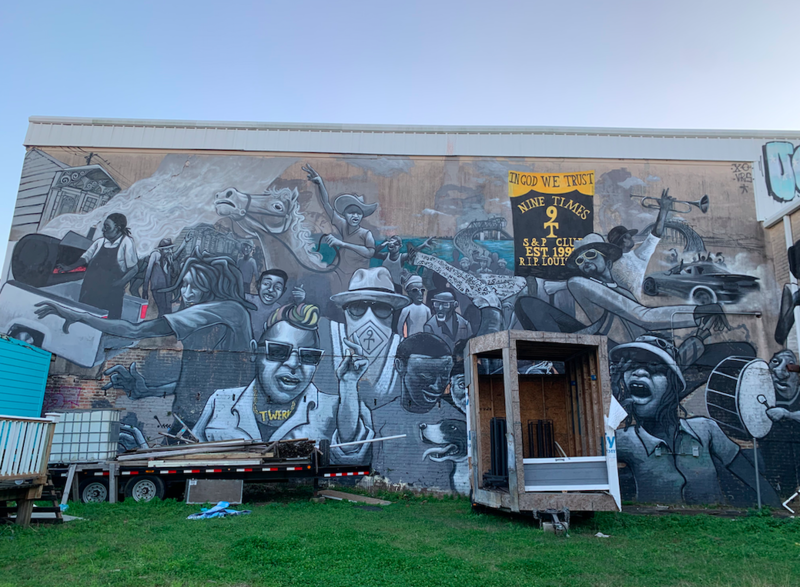 Through the individual faces and personalities of over a hundred subjects, the wall tells a narrative about the Ninth Ward by illuminating how individual experiences create this community. Even if I were to abandon my life here at Tulane and drop everything to be part of this community, part of this Third Line, my story lacks the authenticity to ever truly belong. The sounds of drums and trumpets, the smells of sweat and barbecue, the faces alive with purpose and dignity, all looked out at me, but they are not mine. 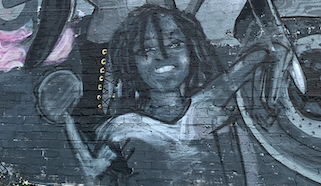 The emotions depicted in the mural are not mine, and the faces are not my friends, the people are not my community, and the mural does not celebrate me. I can only imagine what it feels like to be part of this Ninth Ward family, and what it means to share their experience. That being said, I am not trying to be a hero by proclaiming my whiteness and subsequently abandoning the mural because I just can not possibly relate to it, because that is simply not the case. Despite my distance from the realities depicted on this wall, the beauty and power of the piece lies within the fact that when I look at it, for a moment I feel like I can imagine the experience. Anyone can. Maybe it’s the way the mural stands at 35 feet tall and stretches 150 feet, enveloping its viewers and forcing any audience to feel its energy and pull. Maybe it’s the way the mural depicts over 100 unique people that makes all its onlookers feel connected. Maybe it’s the way these faces radiate life through their expressions and stories that make us feel like we maybe belong on the wall too. Maybe it’s the sheer busyness of character and emotion of the wall that allows me to connect with it. I really think it is the mural’s humanity, shown through the palate of emotions and specific mix of the hues of life painted onto the piece, that makes it so magnetic and feel so universally relatable. In terms of hues of life, I guess I specifically mean that there is not a single emotion left out by this wall, rather than the literal hues of lights, darks, and grays. Whether it be the overall hues and feelings of togetherness and overcoming that radiate from the mural as a whole, or the individual expressions of each character’s being, there is not a fragment of the universal human experience excluded from the piece. In particular there are a few scenes that I found myself unable to pull away from as I found them most prominently to tug at me emotionally. 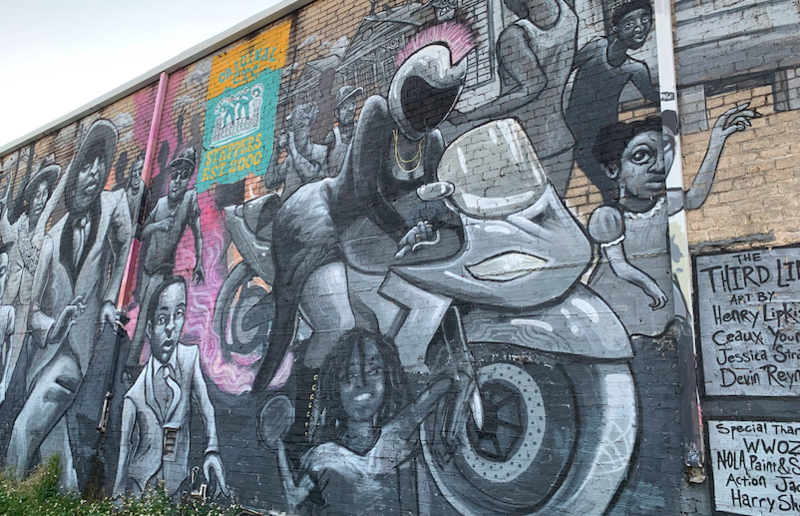 Firstly, despite my distance from the realities depicted on this wall, the positioning of one of the Caramel Curves, New Orleans’s all-female motorcycle club, makes her dominate the mural’s frame and, for me, feel particularly inspiring. Her prominence on the wall and the power she exerts from her pink mo-hawk to her hands tightly gripping the bike’s handles, demands attention and asserts dominance over the entire mural. I interpreted her as a sign of defiance and pride as both her story and illustration embodies an unwillingness to conform which I find empowering. I also found myself really attached to the tank-top man wiping the dripping sweat from his face. While looking at the little tank-top man I was overcome with thankfulness that his existence was purposeful and meaningful enough to be included on the wall. He is so small and seems possibly unnoticed in our busy world; yet, he is so intentional. His presence highlights the need to celebrate both the remarkable and the unremarkable — rethinking what those labels even mean — reminding us of importance and beauty of even the most everyday feelings and occurrences. Being drawn to the motion and emotion illuminated by every brushstroke in the mural, the detail and movement captured by every finger and hand on the wall to illustrate this really amazed me. As someone who speaks with their hands all the time, I personally appreciate all the emotions and meanings tied to the hands and fingers in this piece. Outstretched hands, jazz hands, snapping hands, mid-song singing hands, grooving hands, drumming hands, saxophone hands, strutting hands all add value and energy to the mural. While many of the facial expressions on the characters depict specific and universal moods of happiness, amusement, determination, and pride amongst others, the degree and extremity of these emotions are all captured in the hands. 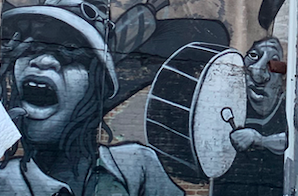 Sure a face may look like it is enjoying itself up on the mural, but when that face has fingers clearly vibing and wiggling away, you know that that person is experiencing a specific flavor of happiness — the kind that makes you want to move. Looking up and around at this piece, I just felt so thankful that it exists and that someone decided there was something, and someone, out there living a life worth capturing. The sheer display of life on this mural made me think about public art in general and the human urge to preserve and express. Thousands and thousands of years ago, even the most primitive humans proclaimed their “alive-ness” with handprints inside caves for all to see (1). Today, instead of caves, our cityscapes are tagged and painted; people’s existences declared and celebrated, frozen and shared. Any form of communication has the ability to transform a moment into a memory, a millisecond into an eternity, and history into reality just because someone decides there is something out there worth sharing. The beauty of sharing these stories and faces on any public canvas, is that they are for all to see (2). Whereas formal art institutions, such as galleries, are only accessible to those with the time, money, and interest to view them, public spaces draped in art are for everyone and often primarily accessible to those excluded by museums (2). Lipkis’s piece is in an area designed to be seen by the very people it celebrates, and therefore not specifically on display for all the Mias of New Orleans. In Lipkis’s case, he looked at a people and a place, and knew that it was all worth preserving, celebrating, and sharing. This piece was written for the alternative journalism class, which is taught at Tulane University by Kelley Crawford. Herzog, Werner, director. Cave of Forgotten Dreams (2017) Full Documentary by Werner Herzog – The Best Documentary Ever. Cave of Forgotten Dreams, Jordyn Hoppe, 15 Nov. 2017, www.youtube.com/watch?v=dIlEfNbcz7g&t=749s.